A former Chinese labor camp inmate has thanked the Oregon woman who helped expose his plight after finding his plea for help hidden in Halloween decorations. 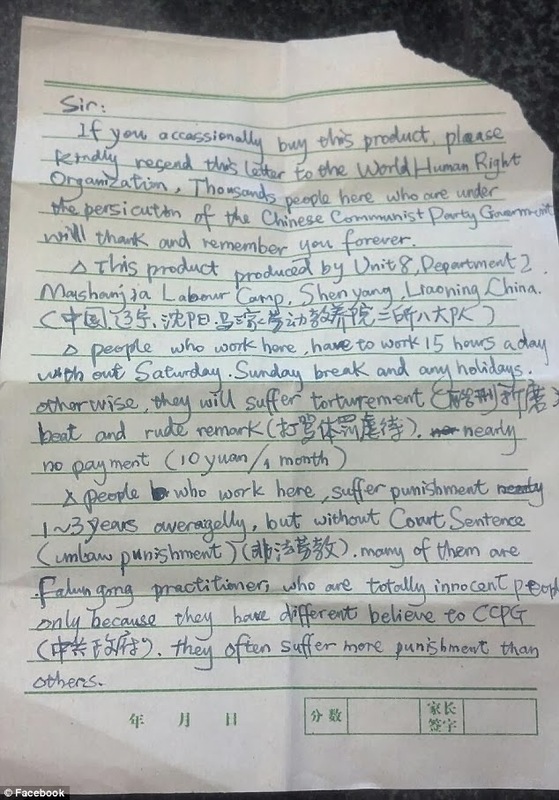 The letter about horrendous working conditions at a Chinese labor camp was found by Julie Keith last year, stuffed between styrofoam headstones of a Totally Ghoul decoration box sold at Kmart. The man named only as Mr Zhang, who spent two and a half years in the notorious Masanjia labor camp in 2008, thanked Ms Keith for her 'righteous action that helped people in desperation'. He had been freed from the camp by the time the letter he risked his life to write was discovered, but Mr Zhang says he is grateful that Ms Keith helped shine a light on the appalling conditions there. The mother-of two, from Portland, had originally thought the letter was a hoax but, after reading up on forced labor camps, she tried to publicize Mr Zhang's plight. Since receiving the note, written in broken English and Chinese, Ms Keith is more careful about buying products from abroad. 'It is quite ironic that it was a bloody graveyard kit that I purchased - knowing that the people who made these kits were desperate and bloody themselves,' Ms Keith said. 'Now I check the labels and try not to buy things I don't necessarily need, especially if it is made in China,' she added. In his first TV interview Mr Zhang, who was sent to the camp just before Beijing hosted the Olympic Games in 2008, says he is still haunted by his time there. If you occasionally buy this product, please kindly resend this letter to the World Human Right Organization. Thousands people here who are under the persicution [sic] of the Chinese Communist Party Government will thank and remember you forever. This product produced by Unit 8, Department 2, Mashanjla Labour Camp, Shen Young, Liaoning, China. People who work here have to work 15 hours a day without Saturday (or) Sunday break and any holidays, otherwise they will suffer torturement [sic], beat and rude remark, nearly no payment (10 Yuan/one month). People who work here suffer punishment 1-3 years averagelly [sic], but without court sentence. Many of them are Falun Gong practitioners who are totally innocent people. Only because they have different believe [sic] to the CCPG, they often suffer more punishment than others. He claimed he was systematically beaten, suffered sleep deprivation and was tortured at the camp in Shenyang, the provincial capital of Liaoning. Mr Zhang came up with the idea of trying to alert the outside world to the prisoners' plight after they were ordered to make Halloween decorations. Using a pen and paper he smuggled into the camp, and writing late at night to avoid being caught by the guards who watched even as inmates tried to sleep under the glare of electric lights, Mr Zhang wrote about 20 letters - one of which reached Ms Keith. When the Oregon mother was unable to get a satisfactory response from the agencies she contacted, she alerted the world's press to her discovery, which made the forced labor camps the center of international attention. She contacted U.S. customs officials who have filed her report, but said they told her there was little they could do. The camp where Mr Zhang was forced to work for long hours has since been closed down as the new leadership in China makes the first steps to reform of its 'reeducation through labor' policy. A 50-year-old Chinese farmer, who was also detained at the camp, returned to it last month after hearing that the remaining inmates had been released. 'We had the 4:15 am wake-up call, worked from 6 am to noon, got a 30-minute lunch and bathroom break, and resumed working until 5:30 pm. Sometimes we had to stay up until midnight if there was too much work - and if you couldn't finish your work, you would be punished,' Liu Hua said. Ms Liu, who suffered from high blood pressure and malnutrition, said she was denied medical care and guards ordered fellow inmates to beat her for being defiant. She lost consciousness during the beating but, when she came round, she was ordered back to work. 'This place was Hell on Earth,' she said. Chinese officials have acknowledged poor living and labor conditions, but denied the use of torture. An official also confirmed that the letter Ms Keith received did come from the Masanjia men's camp. International reports about its discovery caused a stir in the camp. Alongside the production work there are hours of 're-education classes' involving endless repetition of camp rules or singing of patriotic songs while standing in the sun. People like Mr Zhang who speak out about the cruelty of the camps can often find themselves severely punished. Journalist and former New York Times photographer Du Bin, who released a documentary on the Masanjia camp featuring interviews with former inmates has been detained by security officials since May 31, according to his sister. Most of the products are made for use in China, but inmates say they also made coat linings labelled 'Made In Italy' and Christmas wreaths for South Korea, among other items for export. Amnesty International believes there are more than 300 of these camps. The camp drew press attention again in April when Beijing-based Lens Magazine published accounts by former detainees, in which they described being shocked with electric batons, starved, and beaten. The magazine quoted the diary of Masanjia inmate Wang Guilan as saying the camp accepted pregnant women and disabled individuals, forcing them to work for up to 14 hours a day, or risk being beaten. In an interview with Radio Free Asia's Mandarin Service in January, Ms Guilan said that guards at the Masanjia women's camp chained detainees up and tortured them in hideous ways, including sexually. A Kmart spokesman, said in a statement that an internal investigation uncovered no violations of company rules that bar the use of forced labor. The Chinese Communist Party announced this year that it would end the practice by the end of 2013, but said there has been no further public detail.